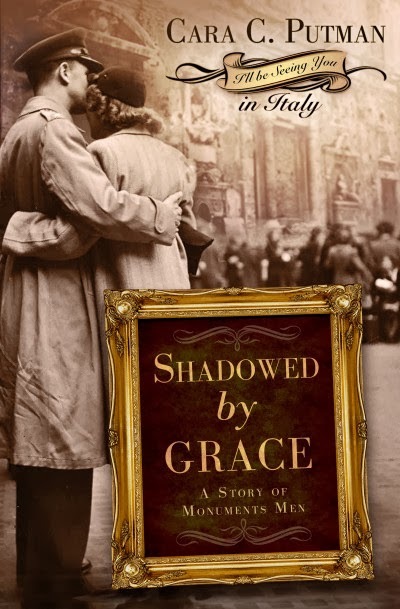 I started reading Shadowed by Grace by Cara C. Putman, thinking that I could begin the book, then move on to start my day. Didn't quite work out that way. I finished the book in one sitting, and then staggered to the kitchen at 10:30 in the morning for my first cup of coffee. It is fair to say that the story quickly pulled me in. I'll start with the negatives about this book: there were a few places where the dialogue was hard to follow, and it was not clear just who was speaking. I'd have to go back, re-read it, and I'd still be confused. In all of the cases, I decided it really didn't matter that much and I moved on. Bottom line: great story, and it felt oh-so-very-realistic throughout. I love historical fiction that actually does seem accurate in the details and in the big picture. The Author's Note at the end of the book confirmed that Cara Putnam did do her homework. The storyline kept me intrigued. Some of the plot twists were entirely predictable, but to me it felt like one of those situations where you know more than the characters do, and so you already know what is going to happen -- you just aren't quite sure how they are going to figure it out. That is to say, although I knew what was coming in a broad sense, it didn't bother me, and I had fun watching the characters get to that point. Of course, reading about all of these beautiful pieces of art made me want to go take an art history class. Hmmm. Maybe I can find a free online one.